Want to create the ultimate user experience with your digital signage and communications technology? There are many ways to create the killer UX, depending on your situation, goals, people, and budget. First, think about these features: touch, interactivity, visual data, and mobile content. Plan ahead and hit all four with engaging presentations, and you’re well on your way. Also think about how younger generations use their devices and how you can get your message in front of them. We discussed the art of creating effective UX with Joe Giebel, sales director of Four Winds Interactive, a visual communications software and planning company that helps form and implement digital signage communications strategies. The following points are the key takeaways. Be sure to make these signs part of your digital signage strategy. A touchscreen kiosk provides Colorado State University students with information about the housing and dining services at the Durrell Center. “PCAP (projected capacitive) displays are really becoming cost effective,” Giebel said. “PCAP is the photo-capacitive touch interaction. It’s something you’re used to on your tablets and your phones. We’re starting to mirror that on the large-format displays. If I were looking at interactivity and touchscreens, PCAP is definitely where I would be focused. Aren’t touch and interactivity one and the same? Interactive displays at Colorado University’s Champions Center provide visitors with an engaging way to learn about its sports programs’ history. “We’re starting to look at how can we create interactivity outside of a touch,” Giebel said. “How can we get data integration to be relevant so that the content on the screen is what the user expects at the right time, and enables them to make a decision or take action faster than they normally would if they had to go into a system and pull reports and do analysis? At the end of the day, we’re creating an experience. “My team and I focus on a lot of corporate applications. How can you better inform employees? How can you allow them to take action and really enable them? You can build a dashboard, or pull reports out of different BI (building intelligence) systems, but you really need an analytical mind to understand what you’re looking at. When we visualize that data and boil it down to something simple, that creates action. “Also, don’t forget the push model and the non-interactive screen. What can you present and put in front of people that enables them to do their jobs better without having to touch the screen? “Digital signage is important because making information visual makes it easy [to understand],” Giebel continued. “It’s engaging, and it allows people to understand what’s going on. In four seconds of looking at a screen, you can get an impression of what you should be interested in and what needs to be managed. That’s how we should look at that data. “We often interact with our clients to say, ‘What would be effective for you? What story do you really want to tell with this data?’ It can be a challenge to understand that. Have bad data? Visualize it, Giebel advised. 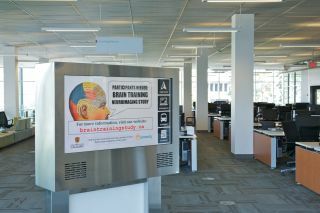 The University of Calgary employs touch kiosks that present information in a streamlined, intuitive way. Want to work on your employee engagement? Bringing mobile into the management side of content and the user experience is occurring,” Giebel said. “We’re doing everything on our phones, on our tablets. That device portability and being able to use content on any device is a trend we’re seeing and really working on. “We’re hiring more and more Millennials into the workforce. Watch them: They grew up on devices. They’re fixated on them. Sometimes people get frustrated by that; you should take advantage of it. They’re paying attention to something. Put yourself and your information on the devices that they choose to give their time to, and you’ll reach them in a far more effective manner. Not only screens on walls—screens in pockets, screens in briefcases. Make sure that information’s wherever the user chooses to get their information, and that will give you the best results. That’s where you really need a cross-platform capability.